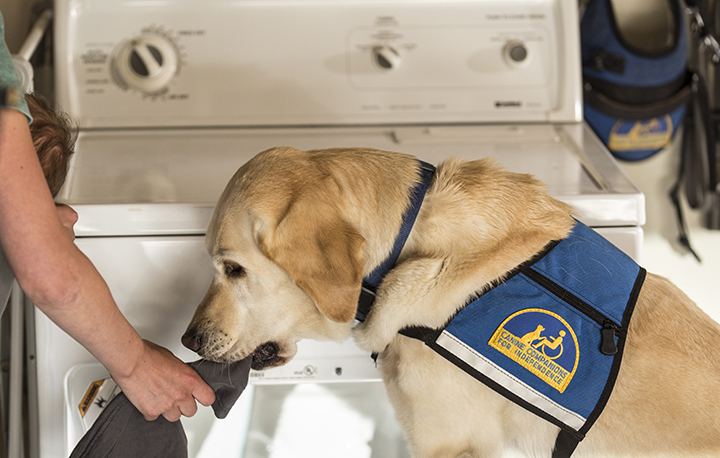 In August of 2000, after the application, interviews, waiting list and much anticipation, my mom and I loaded our stuff into a van and set out for Team Training at Canine Companions for Independence. At the end of the two-week training, I graduated with my first assistance dog, Keno. To my parents, Skilled Companion Keno was an important symbol of my independence, something they knew I’d have to fight for. I have a spinal cord injury, resulting in low muscle tone, poor balance and very limited endurance for walking, so I use a wheelchair most of the time. Keno filled in my gaps, carrying my backpack around the house, picking things up for me and even tugging my hamper to the laundry room — all tasks and chores that the average kid just does (or doesn’t do. Ha!) without thinking too hard. Keno worked for nine fantastic years before retiring, and he set an extremely high bar for what I could accomplish independently. In 2011, I was matched with Service Dog Bright. Fast forward to the present day and now I’m the mom. My one-year-old daughter, Arwen, keeps me busier than anything I’ve ever experienced before. Bright has adjusted beautifully to the addition to our pack, and allows me to focus fully on Arwen by making otherwise strenuous tasks a total breeze. I spend most of my day with a toddler climbing on me or riding in my lap, so Bright’s on dropped item duty, retrieving everything from diaper cream to toys to loose change. Conveniently, that skill often doubles as entertainment for Arwen — sometimes she and Bright even play “pick up the thing Arwen repeatedly throws on the floor from her booster seat” long enough for me to drink my coffee. A slightly flustered, wheelchair-using, first-time mom attempts to shop for groceries with a squirmy, feisty toddler in her lap and a tote hanging on the back of her chair. She reaches behind her to put a loaf of bread in the tote, but it’s full. Does she put the bread back and go home without a pantry staple? Nope! “Bright, Get,” are the magic words, and they’re off, Bright gingerly gripping the bag of bread in her teeth, happily pulling Mama, baby and all the groceries to the register. Being a mom is rewarding, and also really hard. It challenges our bodies, minds, spirits…and grocery budgets. That’s a universal truth, and it doesn’t matter if you’re disabled or not. But adding disability to the dynamic makes some of the day-to-day responsibilities appear nearly impossible. 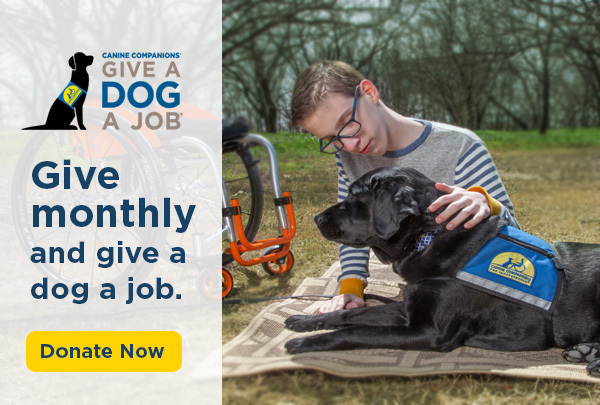 Because of the generosity of donors, Canine Companions has matched me with two different and perfect dogs free of charge. The first supported me as a daughter learning to be independent, and the second helps me overcome those impossibilities in order to be the mom my daughter deserves. This story comes full circle: In 2016, my own mother, who is an upper limb amputee, received her own Canine Companions service dog, Ralene. On behalf of all the mothers you’ve helped to face down the impossible, thank you.